Republican members of the United States Congress have periodically sought to jawbone endowed private colleges and universities into spending more of their income and assets—particularly on undergraduate financial aid, and sometimes for other purposes. Shortly before the financial crisis vaporized a scary proportion of those assets (about $10 billion, or nearly 30 percent, in Harvard’s case), Senator Charles Grassley, of Iowa, led colleagues in investigations of institutions’ endowments, the possibility of mandating a 5 percent annual distribution rate (like the rule governing nonprofit foundations), and related subjects. As reported this winter, Representative Tom Reed (New York) proposed legislation that would require that 25 percent of endowment income be spent on financial aid for lower-income students. (In Harvard’s case, that formula would seemingly require spending far more than the total cost of tuition in some years.) And in February, Senator Orrin G. Hatch (Utah; Committee on Finance) and Representative Kevin Brady (Texas; chair, Committee on Ways and Means) and Representative Peter Roskam (Illinois; chair, Ways and Means Oversight Subcommittee) sent a very broad set of questions pertaining to endowments, aid, investment management, and financial practices to the 56 private institutions with endowments valued at $1 billion or more. (Read their letter here.) The Hill reports on the political landscape. Responses were due by April 1: the same day, as it happens, that Harvard mailed ballots to eligible alumni for this year’s election of five members of the Board of Overseers—an election that is contested by a slate of petition candidates who are critical of certain endowment policies and advocate devoting University financial resources to the elimination of undergraduate tuition. In that context—under obligation to respond to the members of Congress, and with other issues and claims at stake closer to home—the University’s response makes fruitful reading. It would be fair to say that even within the Harvard community, not many people know what the endowment is, how it is owned and functions, and so on. Some of those matters are broadly addressed. (Others—like intra-Harvard transfers of funds and various assessments made on endowment distributions to the schools to fund University operations—remain opaque, perhaps to be revisited on other occasions.) Interested readers may find the entire University letter worthwhile, both for financial insights and as a peculiar form of institutional literature; some highlights are presented here. America’s colleges and universities are admired the world over because of a long-standing and shared commitment—among citizens, institutions, and state and federal governments—to educating individuals regardless of their backgrounds, to driving discovery and innovation, and to serving the public. The federal government is a vital partner in this effort, providing strong federal student-aid programs, tax benefits to encourage students to pursue higher education, funding for basic and applied research, and support for charitable organizations, as offered in the tax code. 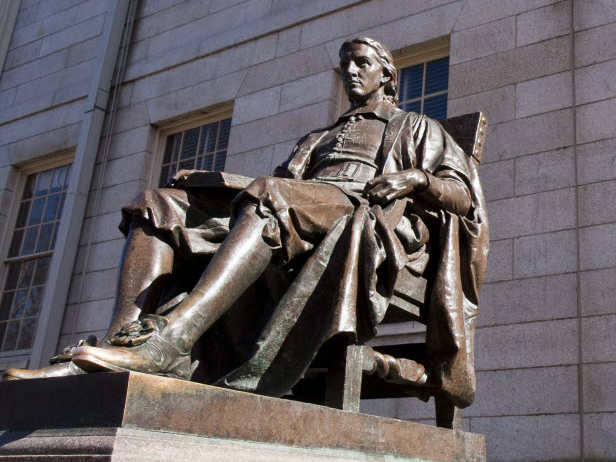 [W]hile alumni, philanthropists, and others are primarily motivated to give to Harvard to support students and scholars, the incentives in the tax code efficiently encourage their support and have helped build an institution that continues to advance the public good through the pursuit of knowledge. The endowment supports activities across the University’s teaching and research mission—to the tune of $1.6 billion in fiscal 2015, and including substantial spending on financial aid. Donor priorities. The purposes for which restricted endowments are restricted are, in decreasing order, professorships; financial aid; teaching and research programs; and other lesser categories of intended use. This may be the first published estimate of the loss in purchasing power; it is calculated using the Higher Education Price Index, which differs from (and is generally larger) than the Consumer Price Index, reflecting educational institutions’ characteristic categories of expenses. The fact that the University in effect skipped a capital-campaign cycle during the first decade of the millennium (following the change in presidencies and then the financial crisis and recession) exacerbated the depressing effects of the crisis on the value of endowment assets. The report also hints at the costs of managing endowment assets. Harvard has always insisted that its hybrid management model (with HMC investing a portion of the assets itself, and less expensively, and external managers investing the rest) provided important economies. It has not detailed those economies to any significant extent, other than reporting, as in the fiscal 2014 HMC letter, that its studies suggested savings of “approximately $2.0 billion over the last decade as compared to the cost of management for a completely external model” delivering equivalent investment returns. The response to the congressional query notes that the management cost for internally managed funds is “generally below 0.75 percent” and that for externally managed funds “generally averages 1-2 percent of assets under management.” These figures presumably exclude investment expenses, like trading commissions, and performance-based compensation to external managers, which is typically considered a share of investment returns, not a “cost of management.” The cost differential also may reflect, in part, HMC’s internal management of equity and fixed-income portfolios, which command lower fees than less liquid asset classes, such as private equity and hedge funds. Making a back-of-the-envelope calculation, and applying the fiscal 2014 distribution of 40 percent of assets internally managed and 60 percent externally managed to the fiscal 2015 assets ($37.6 billion) yields, very roughly, $110 million of internal costs (at 0.75 percent) and $225 million to $450 million of external management costs (at 1 percent to 2 percent). Presumably, private-equity and hedge-fund managers’ “carried interest” (often 20 percent of investment gains) would be atop those fees, and would be paid by subtracting them from HMC’s realized and reported investment returns. Regular annual distributions can be supplemented by “incremental payouts for priority funding areas on a fund-by-fund basis.” Such extra distributions “must be time-limited, financially prudent, and consistent with donor restrictions. As examples, Harvard’s response identified one-time funding for acquisition of laboratory equipment and “to upgrade undergraduate student housing and dormitories.” The Faculty of Arts and Sciences’ annual financial reports, for instance, document “decapitalizations” of some $390 million during the past four years, a significant portion of which underpins the House renewal project—accounting in part for the slower rate of recovery in FAS’s endowment compared to Harvard’s overall. In fiscal 2010, the payout rate rose, to an unusually high 6.1 percent—but given the endowment’s sharp depreciation, the sum distributed, in absolute terms, decreased by $100 million from the prior year. In the longer perspective, the toll of the financial crisis on the University’s financial trajectory is especially clear. Endowment distributions paid out rose from $1.063 billion in fiscal 2006 to $1.656 billion in fiscal 2009; declined to $1.427 billion in fiscal 2011; and have since averaged in a range of $1.7 billion to $1.8 billion per year. In other words, Harvard downshifted from a period of vigorous, endowment-fueled growth, to a period of sharp constraint, and has now been in a multiyear period of “new-normal” stability, with essentially flat contributions from the endowment. Over time, endowment gifts from The Harvard Campaign ought to help revive asset growth and distributions. grant-based aid packages that do not require loans. Students who chose to take out loans (one-quarter of the class of 2015) had median debt of $10,900. One-quarter of the annual endowment distribution, approximately, is spent on tuition aid, University-wide. Within the College, since the introduction of the financial-aid initiative in fiscal 2004, the proportion of students who receive Pell Grants (commonly used as a measure for lower-income students) rose from 10 percent to 19 percent in fiscal years 2011 through 2014, and to 18 percent in fiscal 2015. Similarly, the percentage of freshmen considered the core beneficiaries of the financial-aid initiative (with family incomes below $80,000) rose from 14 percent (fiscal 2004) to 26 percent (fiscal 2008), and has since fluctuated between 23 percent and 26 percent. The university filings make it possible to compare institutions. Princeton’s (referred to above, on investment-management experiences) provides a financial snapshot of a peer institution that differs in revealing respects from Harvard. So it is financially consequential that Princeton’s endowment per student is much larger than Harvard’s—in recent years, about $1 million per capita. Ignoring what may be differences in operating expenses in their communities, the fact that Princeton is heavily endowed, and does not have equivalent costs like those associated with medical research, gives it a great deal of flexibility. First, according to its congressional filing, Princeton derives about half its operating revenue (47 percent in fiscal 2016) from endowment distributions (versus Harvard’s 35 percent). Finally, Princeton—apparently given its strong endowment and its institutional cost structure—is comfortable with a higher distribution rate than Harvard wishes to maintain. From 1979 to 2009, it reports, the target payout rate was 4 percent to 5 percent. In fiscal 2009 the upper bound was raised to 5.75 percent. And effective last July, the upper bound was raised again, to 6.25 percent. Given recent strong endowment investment returns and fiscal restraint after the financial crisis, Princeton’s actual spending rate has progressively declined in recent years, reaching a low of 4.2 percent in fiscal 2015—a different way of portraying its relatively strong financial position (particularly given its heavily endowment-funded operating budget). The board noted that, over time, the University’s spending policies, although designed to achieve intergenerational equity, tended in practice to favor future generations. Despite the downturn of 2008-09, the payout from the University’s endowed funds today is in general higher, even after adjusting for inflation, than at the time when the funds were created. The board also noted that relatively low spend rates might under some circumstances disadvantage both current and future generations. That is true because the University depends on three different kinds of capital: financial capital (especially the endowment); physical capital (buildings and grounds); and human capital (faculty, students, staff, and alumni). The University’s human capital is the most critical of all: a university’s quality correlates directly with the quality of the people on its campus, and a university relies upon its human talent not only for its current operations but to plan for the future and to attract new talent. If a university fails to spend aggressively enough to sustain the quality of its human capital, it may have to spend even more in the future: the cost of rescuing or rebuilding a second-tier department is generally higher than the cost of sustaining an outstanding one. [The higher payout rate] will also reduce the likelihood that the University will make decisions that favor future generations at the expense of present ones, or that favor financial capital at the expense of human and physical capital. Again, perhaps no other institution could make that decision. In that respect, the congressional inquiries have the useful, if unintended, effect of helping outsider observers distinguish among the fortunate, elite colleges and universities that enjoy significant endowments, suggesting that they in fact have differing costs structures, needs, and financial resources at hand. The absolute size of any one school’s endowment matters, but perhaps less than the size of its endowment relative to its enrollment, programs, and specific operating costs.